Weeds are making a fast and bold appearance in lawns and gardens this week. I am seeing strong growth of ground ivy, (Glechoma hederacea). Ground Ivy is a perennial weed commonly found in turf. It spreads by creeping rhizomes, rooting at the nodes to produce new plants. The purple flowers produce seeds, another way for the plant to spread. Hand pulling is one way to eradicate this creeping vine, but not very effective as the vines break where the nodes are rooting in new spots. It tends to creep through the grass lower than the blades of the lawn mower, thereby not controlled by regular mowings. I find it mostly on the fringes of the lawn, reaching into the flower and vegetable gardens. The best way to kill it is to use a broad leaf weed killer containing 2,4-D or triclopyr. This plant will need more than one application to completely rid the lawn of plants present. New plants will be created from germinating seeds throughout the season. Watch for new invasions and treat accordingly. A pre-emergent herbicide can be used to stop the germination of seeds. Cedar Apple Rust fruiting structures are appearing on the branches of cedar and juniper trees this week. They look like an orange sticky sea creature shocking people not familiar with this fungal disease. 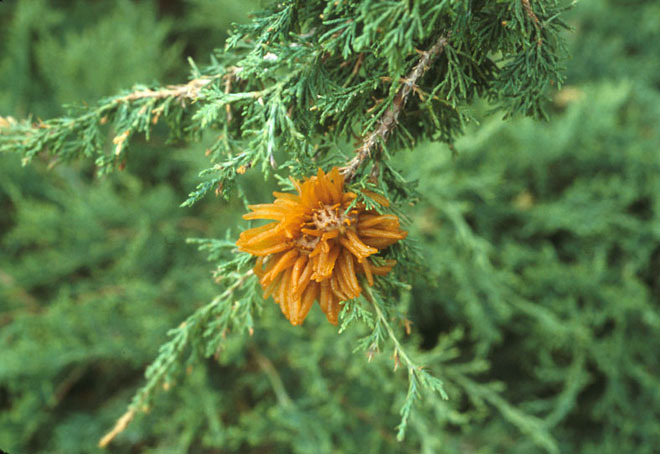 Cedar-apple rust is caused by the fungus Gymnosporangium juniperi-virginianae. The orange horned structure grows out of the overwintering hard brown gall after a few days of rain and cool weather. Spores are produced from the structure beginning and mid-summer, becoming air-borne and dispersed by the wind. These spores will land on the alternate host in the Malus or apple family to continue its life cycle. 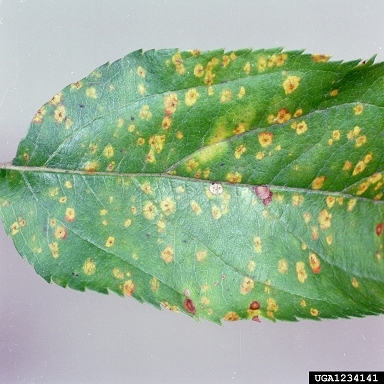 Once an apple or crabapple is infected with the new spores, the fungus develops on the leaves, creating spots and eventually turn the leaves yellow. Early defoliation of the malus tree usually follows.The cedar tree retains the deformed tissue some find unsightly. Control measures used are planting resistant cultivars of trees, sanitation and fungicide sprays. Resistant cultivars of apple include Delicious, Empire, Jonamac, McIntosh, and Paulared. Resistant crapapples are Ellwangerina, Henry Kohankie, Ormiston Roy, and Red Baron. 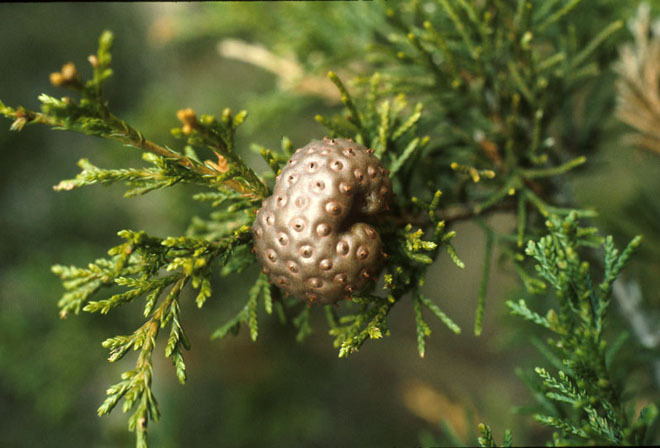 Resistant junipers are Juniperus chinensis var. sargentii, J. communis cv. Aureospica, and J. virginiana cv. Tripartita. Sanitation measures reduce the incidence of infection. Cut off all orange and brown growths on the cedar trees. Do not put these in the compost or them might continue to release spores even after being cut. Bag them for disposal in the the trash. This one action will reduce the amount of spores released in the air. Remove either host trees for up to one mile, although this usually not possible! Fungicide options are available for the apple and crabapple trees, used as a preventative measure before the spores land on the leaves. Fungicide used on the cedar and juniper are not very effective. Rake and remove to the trash any fallen leaves of the apple species. The fungus can overwinter on the leaves to keep the disease cycle going into the next spring. Fungicide labeled for use on apple and crabapple in Connecticut are chlorothalonil, mancozeb, triadimefon, propiconazole, and myclobutanil. Sulfur can be used as an organic fungicide option. Thorough coverage of all leaves are needed for protection. Follow all label directions, more than one application may be necessary for season long control. I enjoyed reading your earlier posts. I hope you pick up the blog again soon.